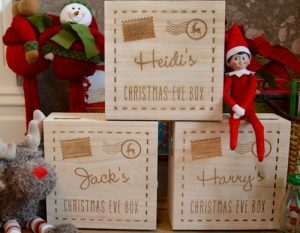 Trending over the past several years is the idea of giving kids a “Christmas Eve Box” top open on Christmas Eve morning. The box can be filled with anything but typically they contain the kind of stuff you might find in a Christmas stocking. But now the trend is starting to catch some flak. Some call it just an extension of the commercialization of Christmas – and yet another way to spoil children over the holiday season. Other parents suggest it is “just one more thing” to get done in creating the perfect Christmas for their families. Christmas Eve is a time of family togetherness. It doesn’t matter what you put in your Christmas Eve Box – it can only put a child in a single-minded world. Just as the day after Christmas is filled with enjoying the new toys, so too is the effect of whatever goes into the Christmas Eve Box. Indeed, some parents sing the praises of what a great distraction the Christmas Eve Box has become – as if their children are a burden to engage with on Christmas Eve. If that’s your idea of the perfect family Christmas Eve then maybe something is wrong with your take on Christmas overall. Harmony Bailey — mother of 3 from Billings, Montana – says her boys couldn’t get enough of their Christmas Eve Box. Her problem, she says, is that she got too clever. Filled with candy, hot wheels and little plastic army men her all-male recipients got the same things and were all happy with it. In fact, the Christmas Eve Box was so good that Christmas morning paled by comparison. And why shouldn’t it? When Christmas for boys includes sox and underwear the Christmas Eve Box, though smaller and more modest, could be all the magic they really experience. 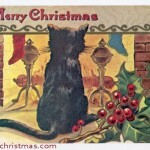 Harmony said her eldest, who was 9 the first time she tried the box, expressed genuine remorse that Christmas morning was nowhere near the surprise and the fun of Christmas Eve. No matter what you do kids compare things. In fact, the day-after-Christmas tradition of “Oh, yeah til you hear what I got from Santa!” is timeless. But the Christmas Eve Box takes comparison and division to a whole new level. Felicia Knutsen of Duluth, Minnesota tells the sad story of two daughters – one 3 years of age and one 11 years of age. The contents of their boxes should not have mattered, right? The 11 year old had candy the 3 year old envied (and could never have, due to choking hazards). But even more surprising was the disappointment the 11 year old expressed at not having more toys to play with like her little sister. Then there’s the problem with keeping up with the Joneses. The Christmas Eve Box is such a hot trend for Christmas in Europe that one Mom from the UK had to bow out because the competition was too great with just her neighbors. 5. It kills the fires of imagination. Some Dads have strong opinions about the Christmas Eve Box trend, too. Greg Gregerson of Layton, Utah responded strongly to our inquiry about this new “tradition”. Do not be surprised when you order online or you shop in stores to see a myriad of new things thrown at you for Christmas Eve Boxes. It is, literally, just another creative way to throw money at Christmas. I’ll start by saying I don’t have children and live three thousand miles away from my closest family members and we do not get to spend Christmas together very often. Christmas Eve boxes obviously do not happen in my house. That being said, I may be way off the mark, but I think there could be things given in the boxes that wouldn’t make it so dreadful. For example, let’s say you have two children, both under the age of 12. Couldn’t you put some sort of book in their box that could serve as a bed time read that night? Or what about giving each of them some sort of family game for everyone to play together that night? Say you only have time and/or energy to play one game. Split pieces into both boxes so that they have to share and combine them for everyone to play. Give them them a special notepad to write a note to Santa to leave with the milk and cookies. My point is, it doesn’t have to be toys, or candy, it doesn’t even have to be something they get to keep to themselves.